it's summer and that means that it's prime season for picnics and cookouts. 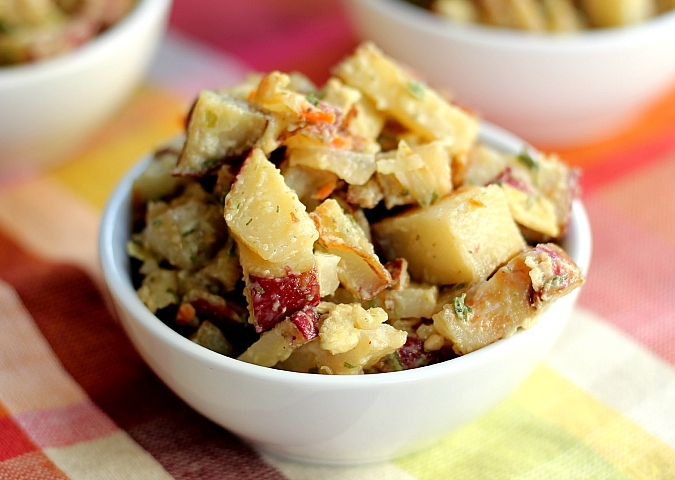 what's a picnic or a cookout without potato salad? sure, traditional old-fashioned potato salad is a classic, but it's fun to switch things up from time to time. we were looking for a side dish for dinner the other day and ryan suggested potato salad. we had bought a bunch of beautiful red potatoes at the farmers market over the weekend and they were just perfect for this salad. 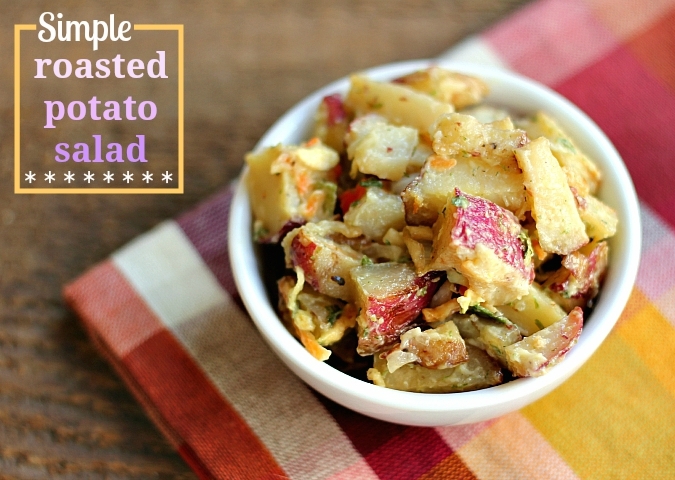 this potato salad is unique because the potatoes are roasted instead of boiled. roasting the potatoes gives the salad such a wonderful rich flavor. we opted to leave the potatoes in large chunks instead of mashing them, although you could certainly mash them if that's what you prefer. i am not usually a fan of using any type of prepackaged seasoning or anything like that, however, i do make an exception for this potato salad. the dressing for this salad is super simple. just mix mayo with a packet of seasoning mix and voila! 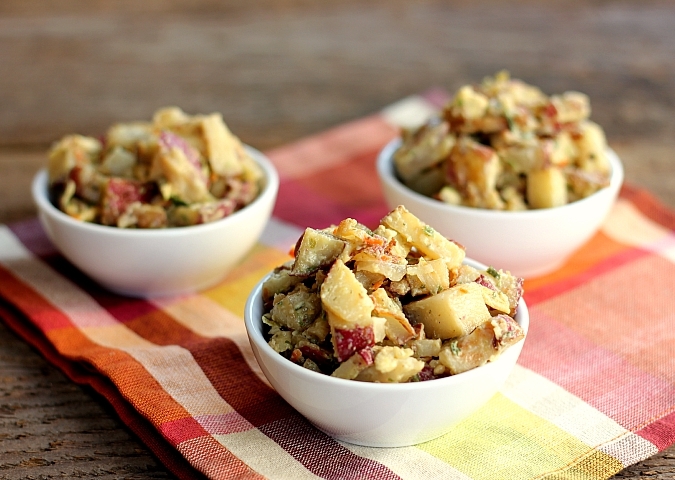 we have made this potato salad with two different types of seasoning mix. it's great with ranch or with vegetable (the vegetable is what's pictured here). sometimes it's okay to make an exception and to take a shortcut i guess. 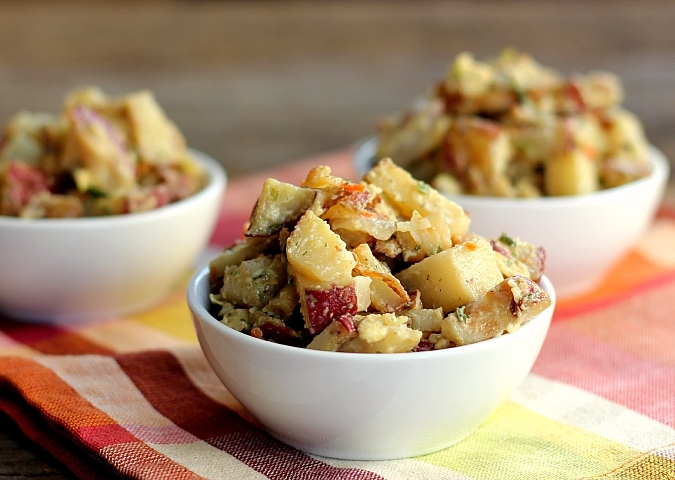 this potato salad is super simple to make and it comes together in no time. it's perfect for a cookout, a picnic, or anytime! we've made this recipe a few times, and it's now our favorite go-to potato salad recipe. preheat your oven to 425 degrees F and line a large baking sheet with aluminum foil. lightly grease the foil with about 1 tablespoon of olive oil. wash and dice the potatoes, mince the garlic, and chop the onion. place the diced potatoes, minced garlic, and about 3/4 of the chopped onion on the baking sheet. lightly drizzle olive oil over the potatoes and season with garlic powder, onion powder, salt, and pepper. roast for 25-30 minutes (tossing occasionally) until the potatoes are tender. once cooked, remove from the oven and allow the potatoes to cool to room temperature. combine the remaining chopped onion with the mayonnaise, dry seasoning mix, and chives, then stir well. place the roasted potatoes in a large bowl and pour the dressing over the potatoes. toss well to even coat all of the potatoes with the dressing. refrigerate until ready to serve. That looks delicious. I am ready for a picnic.